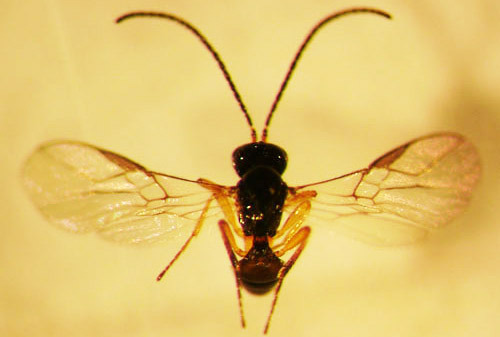 The wasp Opius dissitus Muesebeck is a solitary, larva-pupal, Hymenopteran endoparasitoid of Liriomyza leafminers. Several studies report that Opius dissitus were reared from Liriomyza (Diptera: Agromyzidae) leafminers infesting plant leaves of celery, tomato, potato, beans, etc. (unpublished data, Li et al., Stegmaier 1972). Figure 1. Dorsal view of an adult Opius dissitus Muesebeck, an endoparasite of Liriomyza leafminers. Photograph by Jian Li, University of Florida. Opius dissitus is reported from Africa, Asia, Europe and North America (Bordat et al. 1995a, Petcharat et al. 2002, Stegmaier 1972, Neuenschwander 1987). Adults: The adult Opius dissitus are black in color. The antennae are black and thin, and almost the same length as their body. Eggs: Opius dissitus females lay their eggs directly inside the late stage Liriomyza larvae bodies. The average size of the egg is about 0.28 mm (Bordat et al. 1995a). Larvae: The Opius dissitus larvae develop inside the Liriomyza leafminer larvae. However, the parasitized leafminer larvae still consume the tissue of plant leaves until their pupation. The Opius dissitus larvae develop through two instars inside the leafminer larvae (Bordat et al. 1995a), and eventually kill the leafminer in the pupal stage. The mature Opius dissitus larvae then pupate inside the leafminer pupae. The optimal temperature for Opius dissitus development on host of Liriomyza trifolii is reported as 25–30°C (Bordat at al. 1995b). Figure 2. 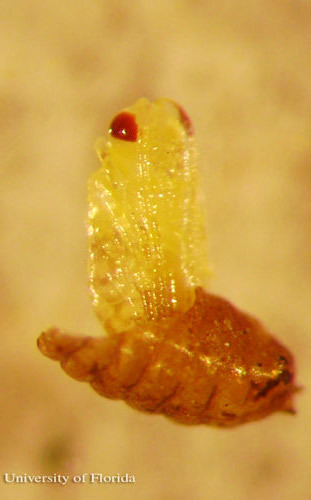 Early stage pupa of Opius dissitus Muesebeck, an endoparasite of Liriomyza leafminers. Photograph by Jian Li, University of Florida. Figure 3. An adult Opius dissitus Muesebeck, an endoparasite of Liriomyza leafminers, emerging from the leafminer's pupa. Photograph by Jian Li, University of Florida. 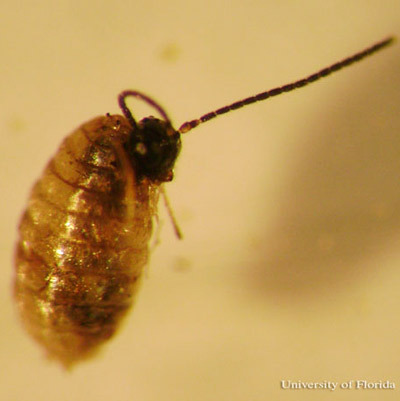 In Florida, Opius dissitus larvae were found and collected, then reared to adults, from the leaves of several crops infested by Liriomyza leafminers (Stegmaier 1972, Schuster and Wharton 1993). Important Liriomyza economic pest species include the pea leafminer, Liriomyza huidobrensis (Blanchard); the vegetable leafminer, Liriomyza sativae Blanchard; and the American serpentine leafminer, Liriomyza trifolii (Burgess). Opius dissitus is a potential biological control agent for Liriomyza leafminers on vegetable and ornamental plants. Opius dissitus was found to be the most abundant parasitoid (63% of all the parasitoids) of Liriomyza trifolii on snap bean crops in south Florida, and the seasonal density of Opius dissitus had a similar pattern with Liriomyza trifolii (unpublished data, Li et al.). Opius dissitus was also found to be one of the major hymenopteran parasitoids of Liriomyza leafminer on tomato crops (Schuster and Wharton 1993). Petitt (2004) reported that Opius dissitus was reared and released to control Liriomyza leafminers at the Walt Disney World Resort. Bordat D. 1995a. Morphometric, biological and behavioral differences between Hemiptarsenus varicornis (Hym., Eulophidae) and Opius dissitus (Hym., Braconidae) parasitoids of Liriomyza trifolii (Dipt., Agromyzidae). Journal of Applied Entomology 119: 423-427. Bordat D. 1995b. Influence of temperature on Opius dissitus (Hym., Braconidae), a parasitoid of Liriomyza trifolii (Dipt: Agromyzidae). Entomophaga. 40: 119-124. Neuenschwander P. 1987. Introduction of exotic parasitic wasps for the control of Liriomyza trifolii (Diptera: Agromyzidae) in Senegal. Tropical Pest Management 33: 290-297. Petcharat J. 2002. Larval parasitoids of agromyzid leafminer genus Liriomyza in the southern Thailand: species and their host plants. Songklanakarin Journal of Scientific Technology 24: 467-472. Petitt LF. 2004. Rearing and release of Opius dissitus (Hymenoptera: Braconidae) for biological control of Liriomyza leafminers at the Walt Disney World Resort. Symposium: Advances In Management For Agromyzid Leaf Miners. 2004 Entomological Sociery of America Annual Meeting and Exhibition. Schuster DJ, Wharton RA. 1993. Hymenopterous parasitoids of leaf-mining Liriomyza spp. (Diptera: Agromyzidae) on tomato in Florida. Environmental Entomology 22: 1188-1191. Publication Date: August 2011. Latest Review August 2018.